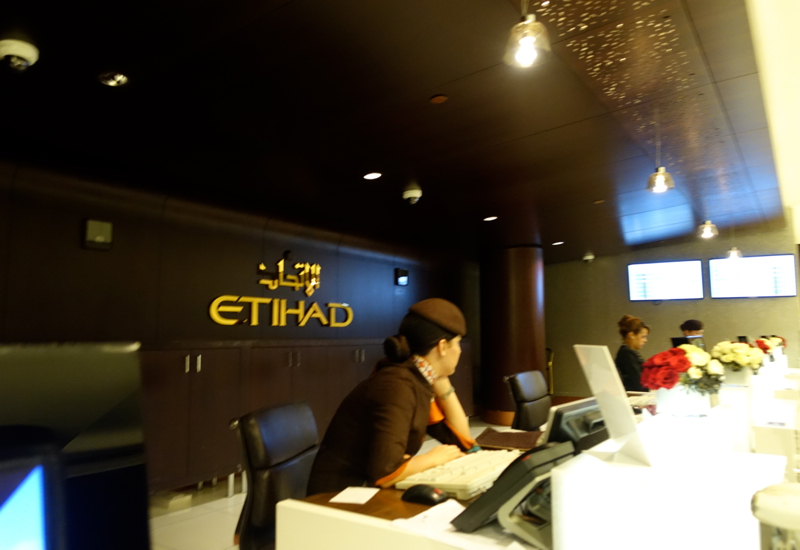 At the airport we alighted at Terminal 3 and headed towards the left, where there is dedicated Etihad First Class check-in. 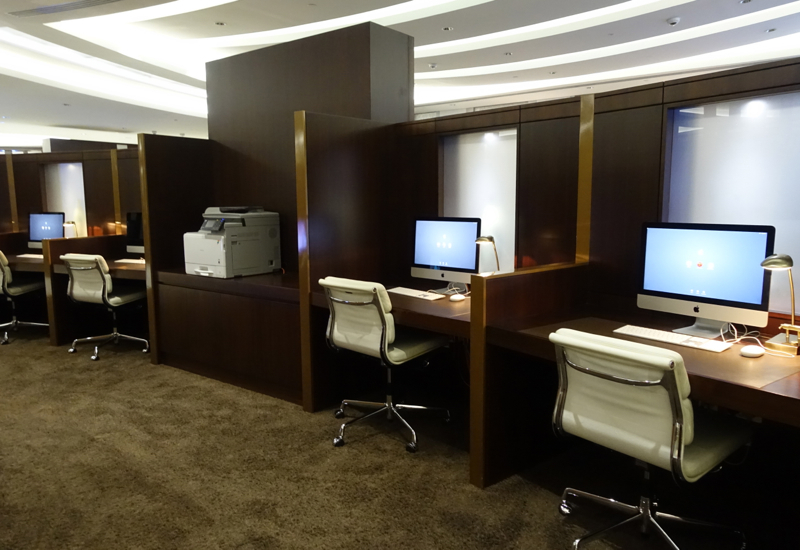 Instead of standing at a counter you sit at a desk across from the agent, similar to at my bank, First Republic–very civilized. 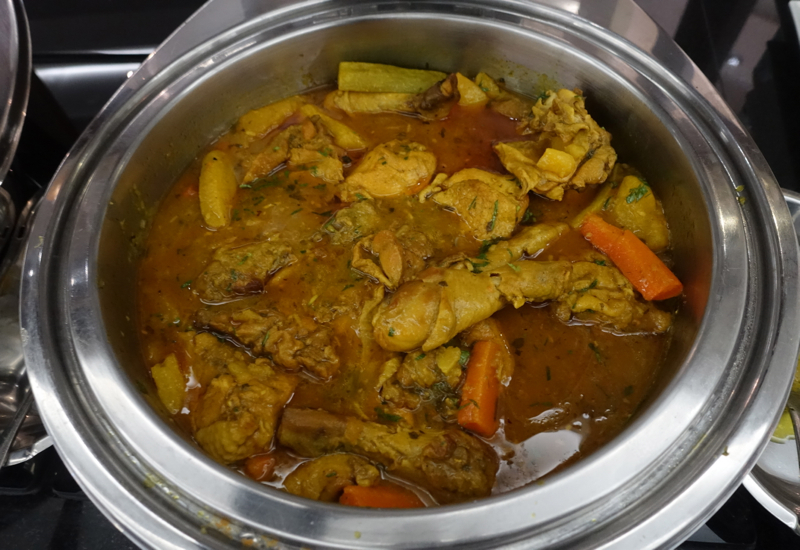 The only thing missing are fresh baked cookies, as at First Republic. 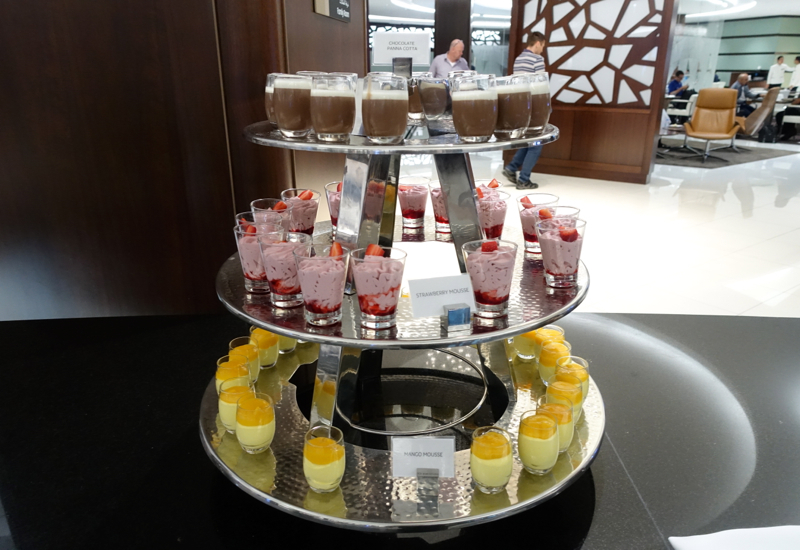 Back when we first flew Etihad First Class in 2013, there was a dedicated, although small Etihad First Class Lounge. 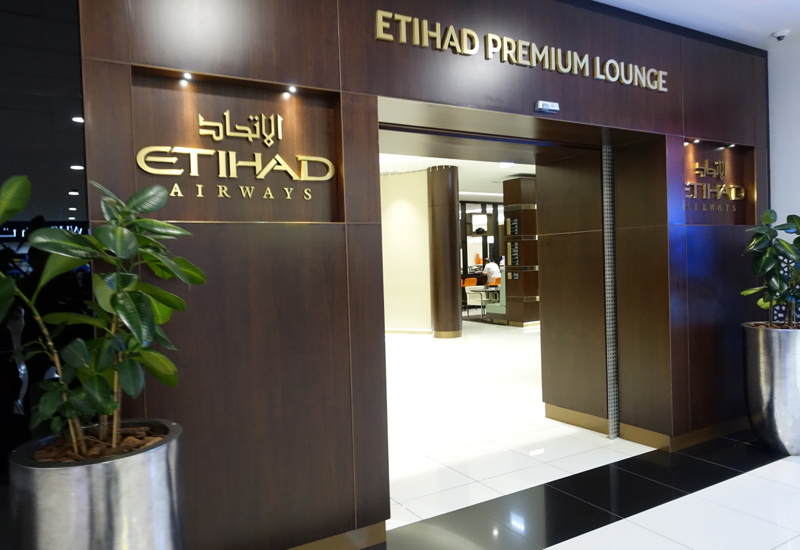 In 2014 they opened the Etihad Premium Lounge for first class and business class passengers, while renovating the First Class Lounge, which has been delayed several times from its original late 2014 opening to various times in 2015, then early 2016. 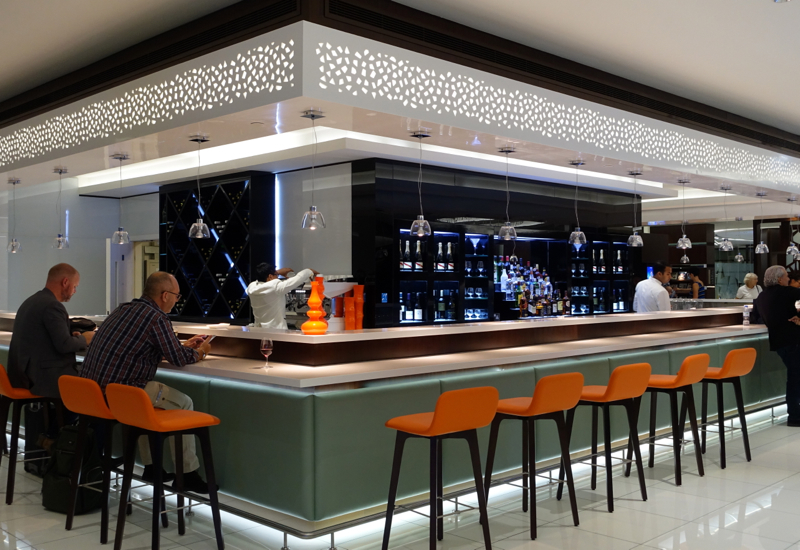 The latest press release says the new First Class Lounge will open in May 2016–we'll see. 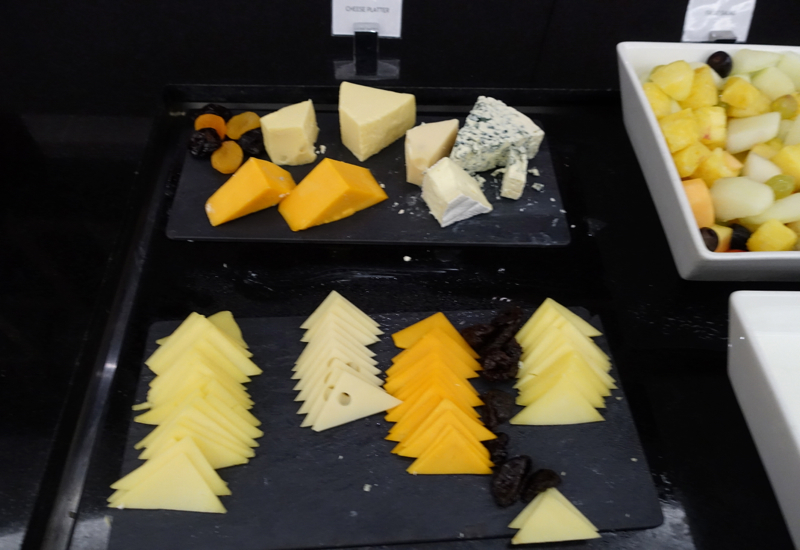 In any case, in the meantime, the current Etihad Premium Lounge in Terminal 3 is located near Gate 35 (the one in Terminal 1 is near the Al Reem Lounge; see Review: Etihad Business Class Lounge Abu Dhabi AUH Terminal 1 for my review of that lounge). 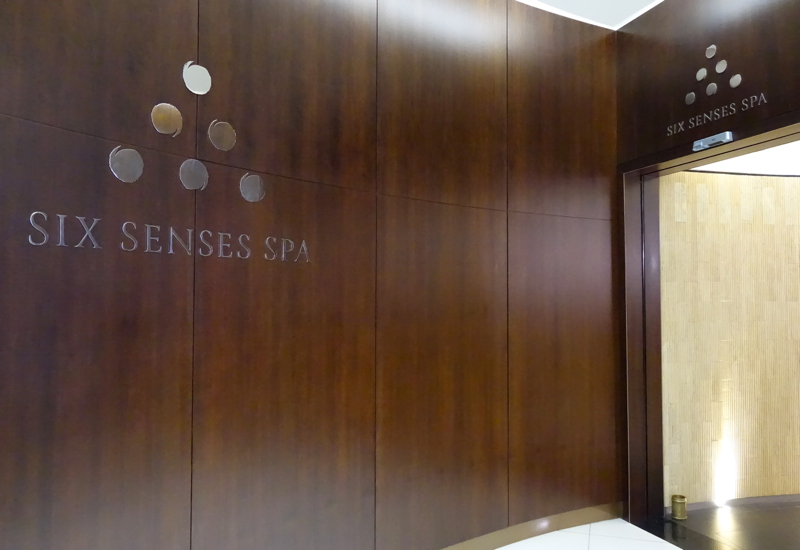 Although we didn't have much time in the lounge, the Six Senses Spa was kind enough to squeeze me in for a complimentary massage. 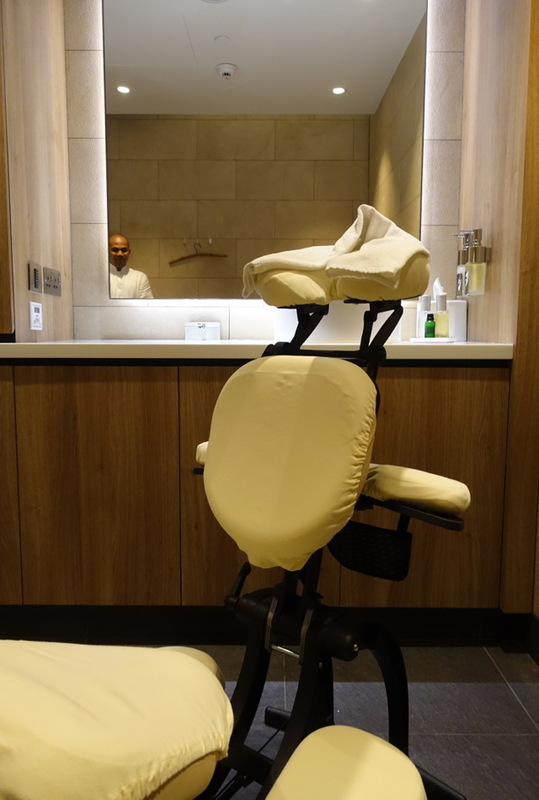 The massage is a chair massage, but on both this occasion and my prior visit in 2013 the massage therapist was excellent–very intuitive in ferreting out all the knots in my neck and shoulder area and working effectively on them. 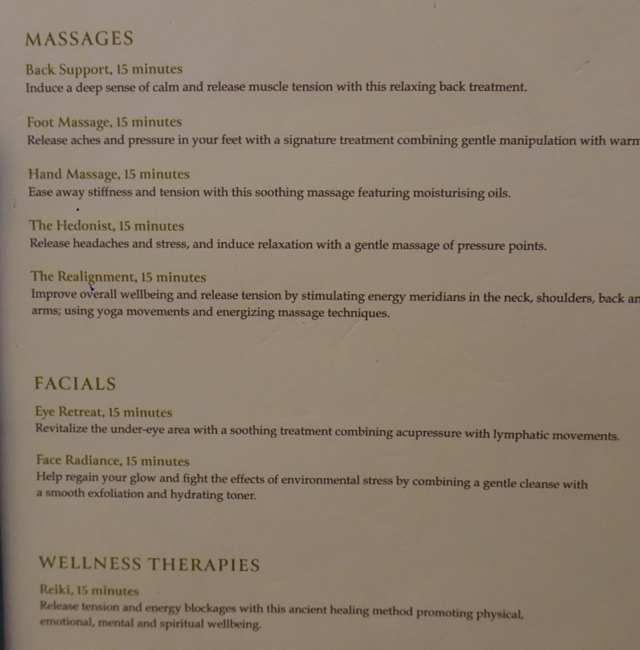 So much better than the British Airways Concorde Lounge Elemis Spa, although of course not the hour long oil massage in Thai Airways First Class Lounge in Bangkok. 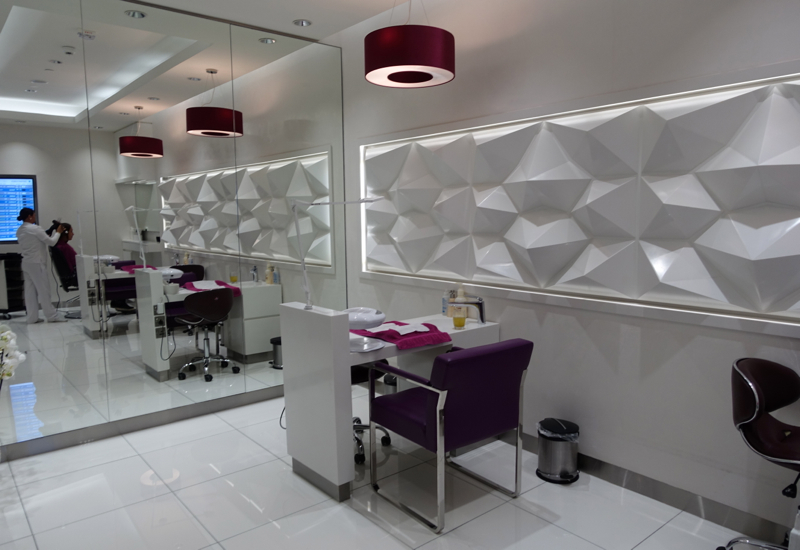 I didn't have time for the Style & Shave Salon, which for women consists of a blow out or various manicure options (sadly, no pedicures). 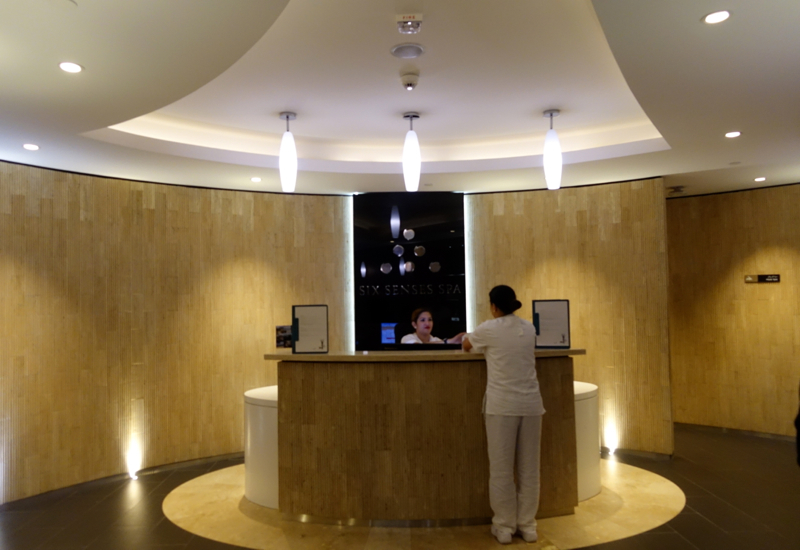 One treatment is complimentary for first class passengers, whereas business class passengers can pay for treatments, and the prices are reasonable. 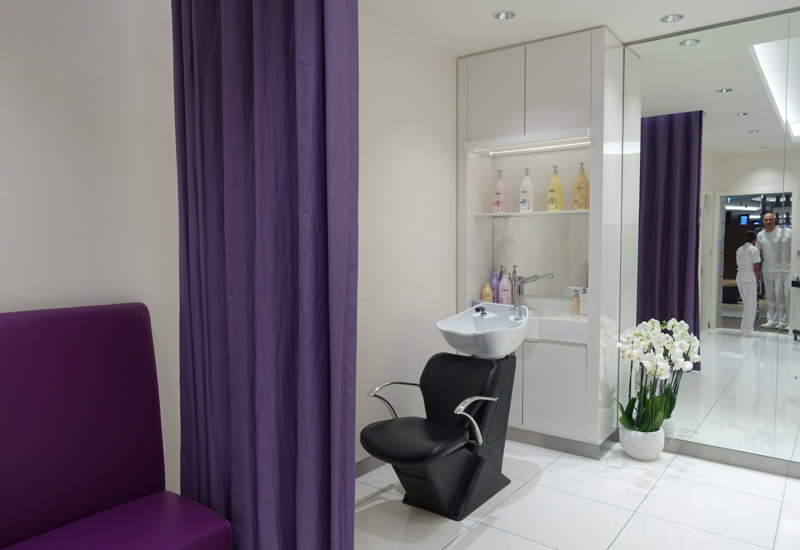 And for men, there's the Shave Salon. 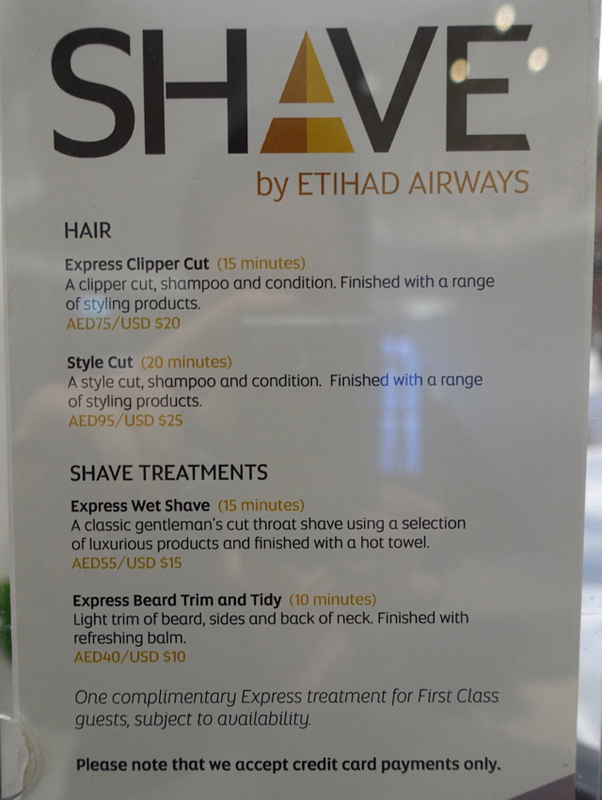 My husband, as he reported in his Etihad Business Class Lounge Abu Dhabi Review, got a great haircut when he visited the lounge before his flight to Sydney. 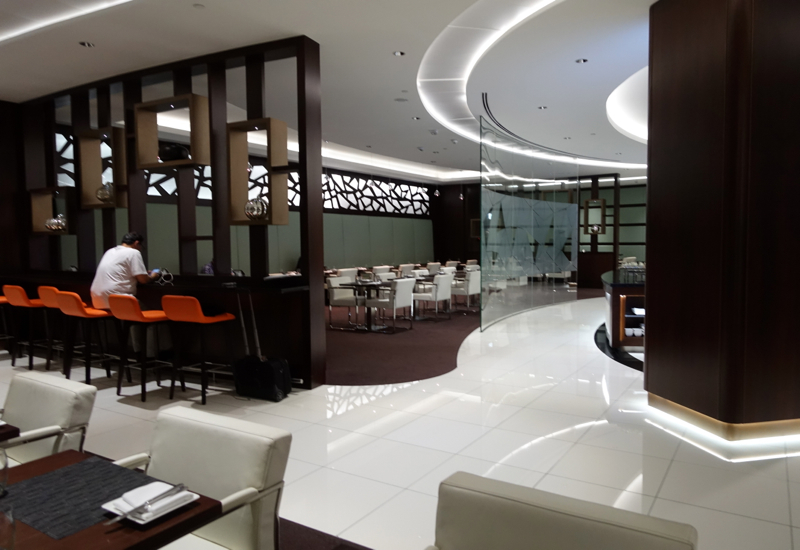 Other amenities include food (via the buffet), shower rooms, a prayer room, smoking room, and den with TV pods (although since you're going to be seated for so long on the flight with primarily a screen for entertainment, that seems a superfluous option). 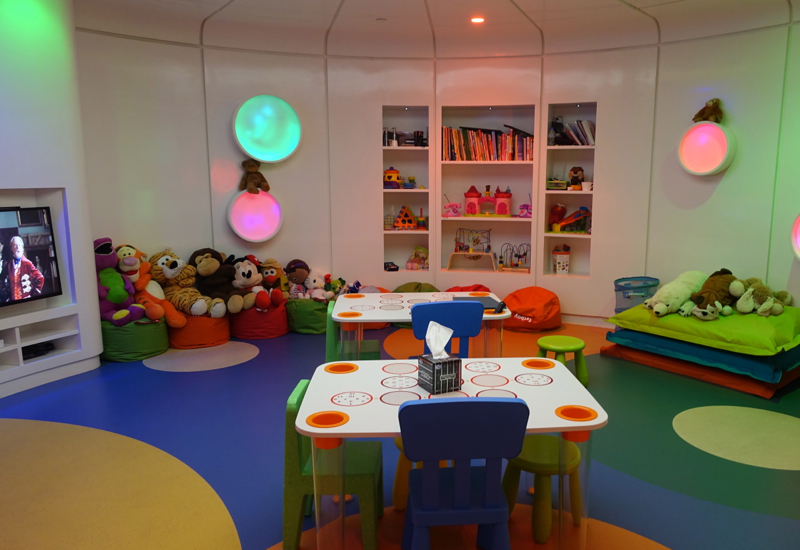 There are no nap rooms however–hopefully the new Etihad First Class Lounge will have a few. 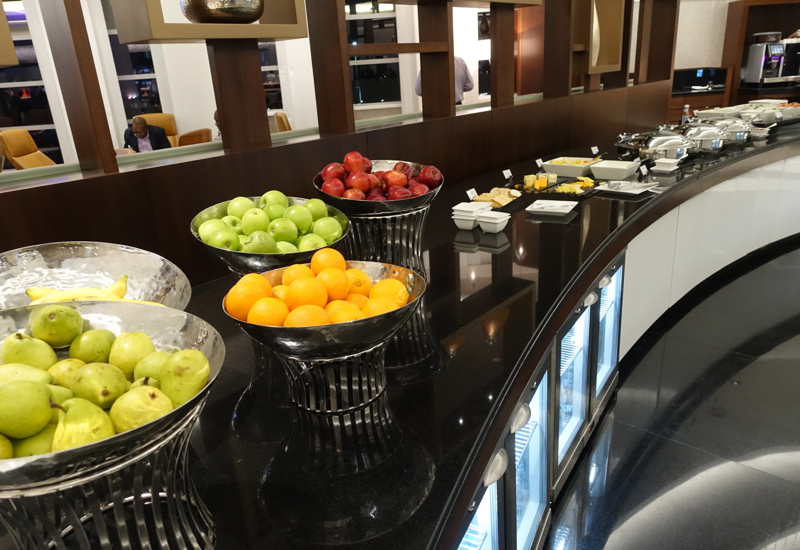 The Etihad Premium Lounge is surprisingly disappointing from a food standpoint, as least compared to other Etihad Premium Lounges such as the Etihad Premium Lounge in Sydney and Etihad Premium Lounge in Washington DC Dulles, which have a la carte menu dining. 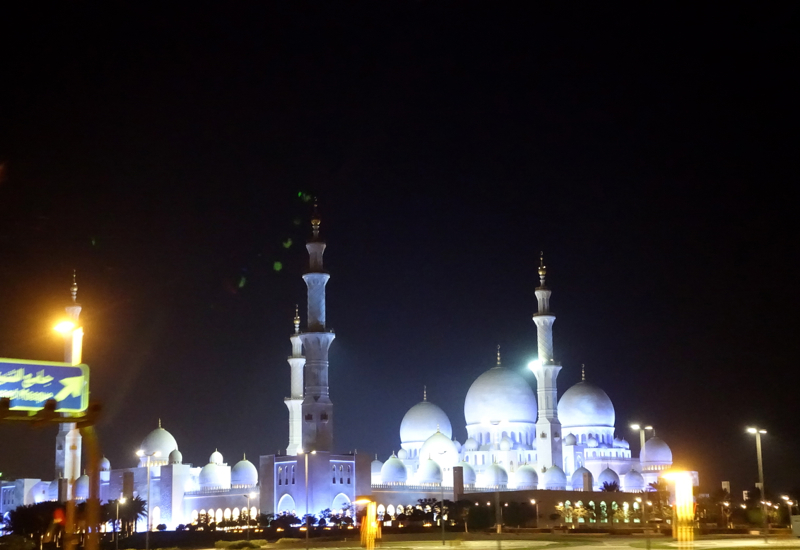 That's probably due to the sheer volume of passengers that use the lounge in Abu Dhabi, given that it's Etihad's hub, but it is a little ironic. 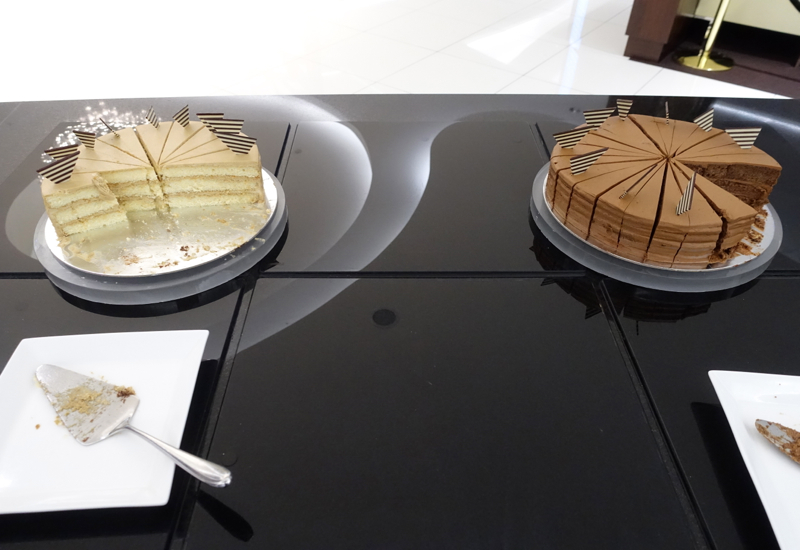 And desserts, none of which tempted me. 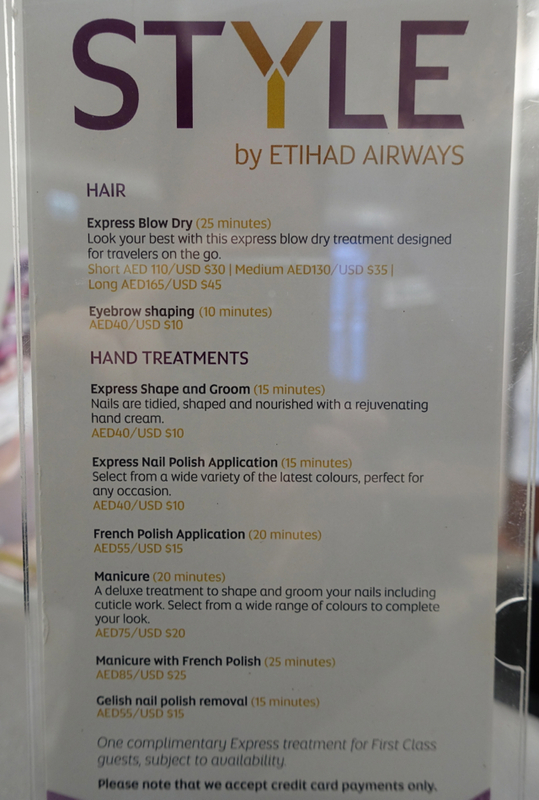 Etihad's Premium Lounge in Abu Dhabi is a very good business lounge, particularly its Six Senses Spa and Style & Shave Salon offerings (although note that business classes do need to pay for Style & Shave services). 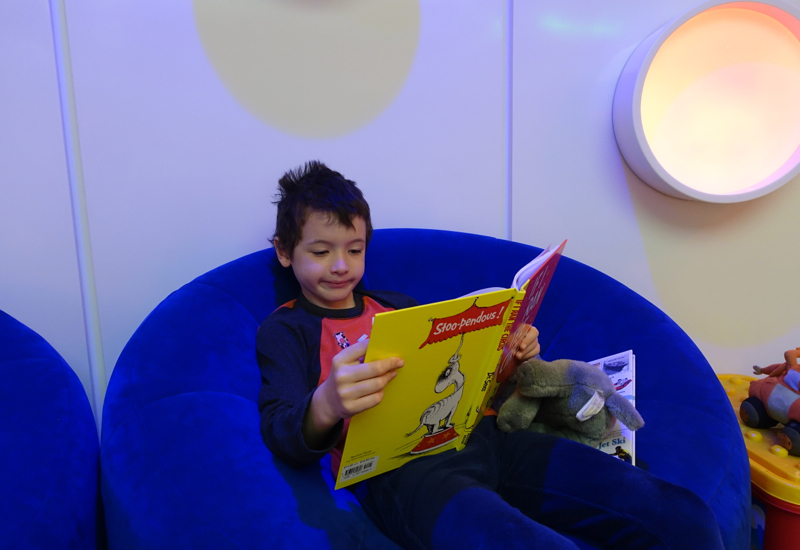 And the Family Room, while not huge, is a welcome service for both kids and exhausted parents, with friendly staff. 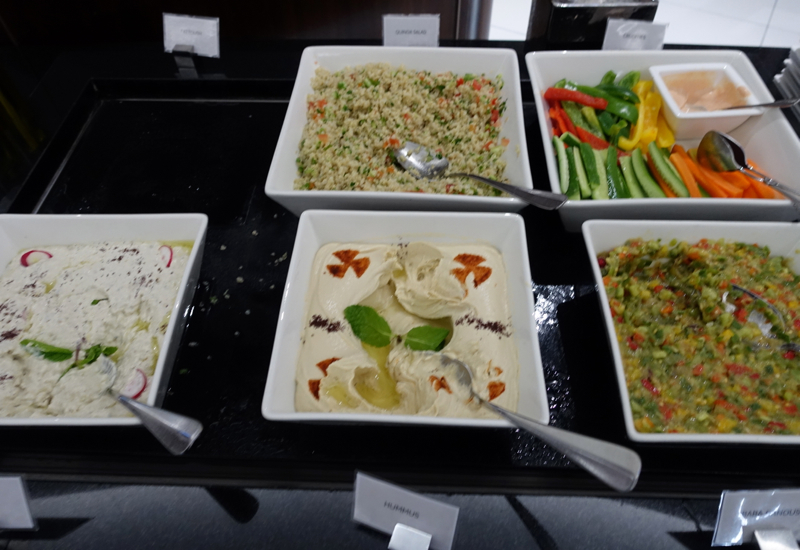 The Etihad Premium Lounge Abu Dhabi food offerings are inferior, however, to what is offered at other Etihad Premium Lounges, where there's a la carte menu service. 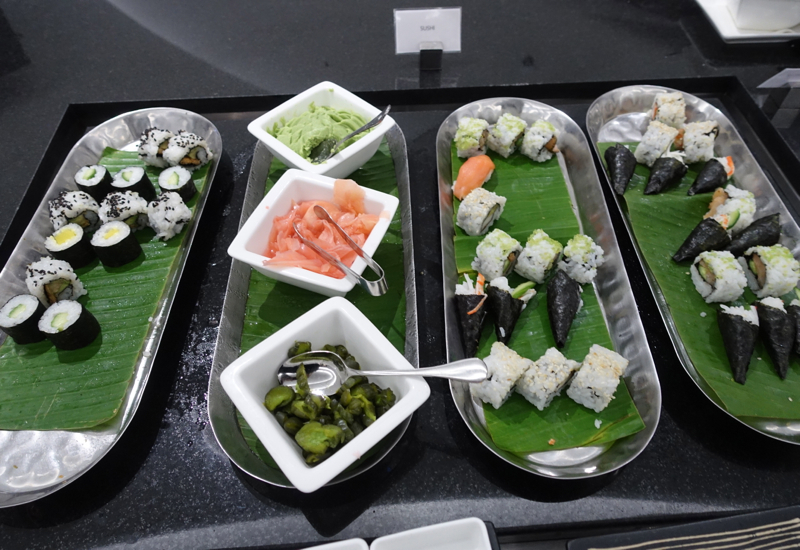 It will be interesting to see the new Etihad First Class Lounge after it opens later in 2016–hopefully it will include nap rooms and also bring back a la carte dining, which were features of the old small Etihad First Class Lounge. 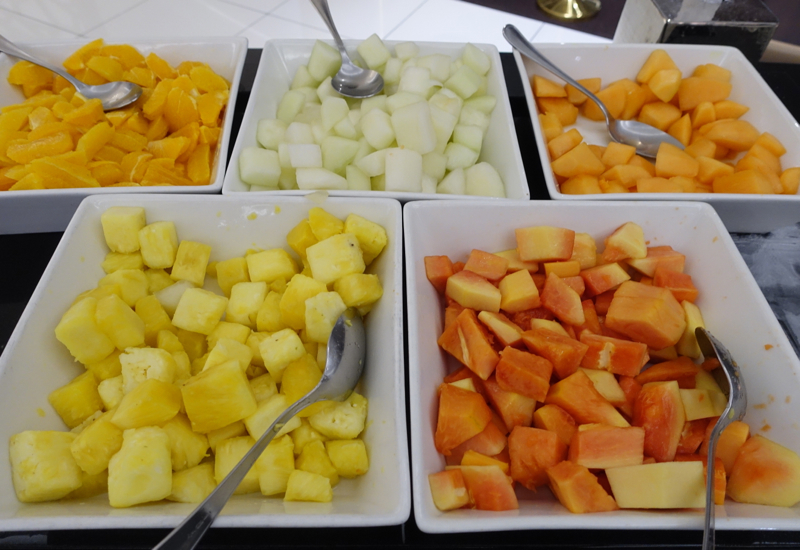 If you've visited the Etihad Airways Premium Lounge in Abu Dhabi recently, what was your experience?